Design Addict Mom: Our Master Bedroom Redo with Pier1. Our Master Bedroom Redo with Pier1. I moved the chair to the opposite side of the room to create this cozy seating area. 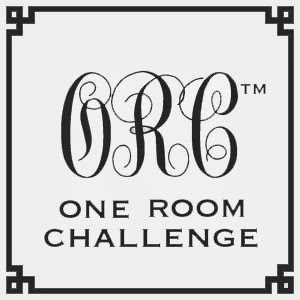 If you followed the one room challenge, then you also shouldn’t be surprised to see the bird art. There was actually a pair, but I had to separate them because they didn’t face each other when placed together. That is not good feng shui and the original design of the space was based on feng shui. Nelson Bench above is my own and was relocated from another room. That's so exciting - congratulations! Your master bedroom continues to look great. Off to check out the article. Adore the colours and the classic wall paper offset by fun pieces and clean lines in contrast! Beautiful make over. Thank you for sharing your work and for the inspiration. I know Lea Hartman, she is amazing woman and photographer. Congratulations on getting published in the newspaper! Your bedroom looks stylish and cozy at the same time. I love the curvy table lamps on the nightstands. Just dying over how great this space looks, Stacey. Congratulations on the article. Looks like 2014 will be your year! Stacey!! Congratulations!! What a fabulous article. This is BIG!! It is such a happy and wonderful room. I love it. What a great start to 2014! Stacey, it is GORGEOUS, and a very well-deserved congratulations to you on the article! xo. WOW, I finally was able to get onto your comments page after a wild ride of ERROR! Stacey, what you have done here is what I've always loved: transformation. I just love what you did! It's cozy and clean and so you. and that bed! so nice. Absolutley love it Stacey! I noticed the rug right away! In love! Wow! I loved your space before, but this is even nicer! Congratulations on this feature! How exciting!! It's nice to see you making Pier one work in this space. p.s.I am sending you an email in the next few minutes. it certainly looks beautiful!!! congrats on the article it's really nice! I love this! The colors are awesome! Have a beautiful day! It looks beautiful!! I'm so excited for you!! Awww, I'm even more in love with this room lady. LOVE the leather ottoman paired with that blue chair (can u loan me them both for a few years?) and those framed embroidered birds add such a soft and whimsical touch. And yes, I think Pier 1 has some of the best scented candles out there. Now if only they'd bring back that peach scented candle they used to have, all would be well with the world. What a beautiful room! I haven't been to Pier One for ages but love so many of the things that you found there! Stacey, this is wonderful. Congratulations, friend! You have amazing taste. I love every detail in your bedroom. it is BEYOND beautiful lady, I love it. I absolutely love your room. It looks just amazing! Well done!